Understanding Microbes is vital to understand the past and the future of mankind and our planet. These are the oldest form of life on the earth. Microbes provide us with oxygen to breathe and food to eat. Without microbes life is impossible on the earth. Microbes cause as well as prevent diseases, hence are highly relevant to medicine and other related health sciences too. Research and biotechnological applications of Microbes is a fascinating field of science and increasingly being seen as a mainstream tenet of biology. 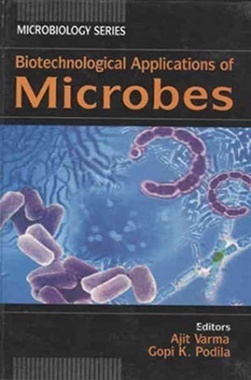 The present book focuses on diverse areas of microbial research and provides a wealth of information on the microbial world: biochemistry of the molecules, their functions, syntheses, and regulation activity; microbial genetics, immunology, biotechnology, control of microbial growth, interactions between humans, insects and microorganisms and public health, microbial ecology, terrestrial microbiology, microbiology of waste treatment and so on. This book useful to both under-and post-graduate students of biological sciences, plant sciences, soil sciences, environmental sciences, microbiology, bioengineering, bioinformatics and biotechnology. 1.The book provides information on the microbial world: biochemistry of the molecules, their function, synthesis, regulation activity, etc. 3.The 15 research articles are contributed by eminent scientists from various regions of the world.